Beneath the Surface – music for shakuhachi, violin and tunnel. Recorded in Tunnel Number Five beneath Darwin. Emily Sheppard (violin); Anja Tait (violin); Anne Norman (shakuhachi); David Matthews (field recording). BLUEPRINT – an album by Fine Blue Thread – Ria Soemardjo (voice); Helen Mountfort (cello); and Sam Evans (Tabla). Breathtaking music… sheer poetry… I am playing shakuhachi on track 1 & 3. I love listening to this album – so many wonderful tracks, such a great trio. 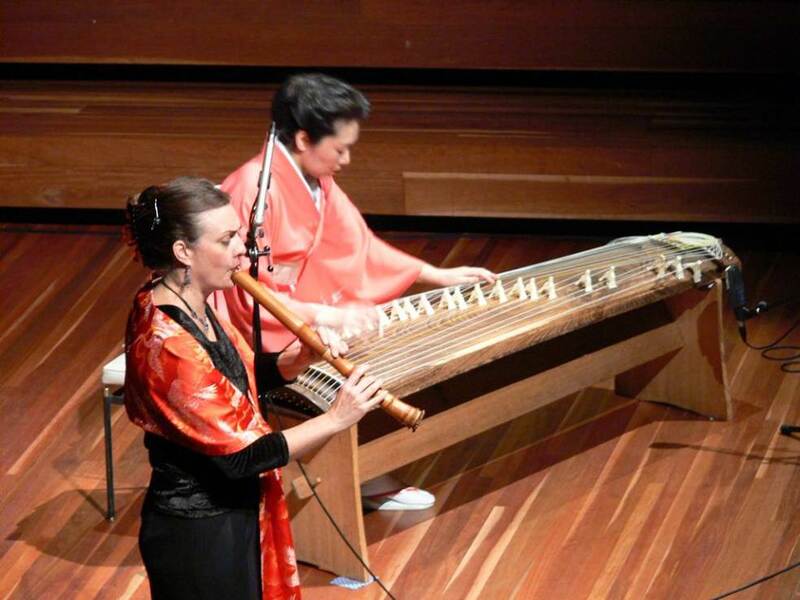 Aki no Kyoku (21 string koto and 1.8 shakuhachi) and Haru no Umi (13 string koto and 1.6 shakuhachi) live performance with Izumi Fujikawa at BMW Edge in June 2006 in Melbourne recorded by Dave Matthews. Solid Rock with the Songmen Eel Festival 2007: Shane Howard, Neil Murray, Bart Willoby, Anne Norman, Marcia Howard. (shakuhachi kicks in after about 4 minutes). tabla, koto, shakuhachi Impro: Sam Evans – Tabla, Anne Norman – Shakuhachi and Izumi Fujikawa – Koto. This is a piece of improvised music, 2006.
visit Anne Norman’s YouTUBE channel for many more clips. Dave Matthews recently put up a few items from my concert late last year with the vocalist Sarah Wilmot. One of the absolute joys of an improvised spontaneous gig, is that no-one knows what is going on … including the performers. In Duet for One, I am assuming that we are about to perform a duo, and Sarah is assuming it is a shakuhachi solo. I make ‘offers’ to Sarah, who has her eyes closed, in listening mode… I was structuring it as a conversation, but only ended up talking with the seagulls … (and momentarily the toilet cistern, that happened to be at the same pitch I was playing) and I quite liked the result. Thanks Sarah! Without you there, this piece would not have come into existence.